On a beautiful Sunday in March of 2006, I left my apartment in Jerusalem and drove due north for about 200 km, until I arrived at Moshav Shtula, which sits on the border between Israel and Lebanon. (On the border, as in: on my morning run, I got about 10 minutes before hitting the UN blue line and turning around.) I went to spend a week with Sara Hatan, a Kurdish immigrant who had raised her family (14 children!) on Shtula and established a reputation as an excellent cook. My friend Neil, who sent me to Sara, told me that people came to visit her restaurant from across the tiny country. They said her kubbeh was the best they'd ever had. And friends, as excited as I was to spend the week washing Sara's dishes and waiting on Shtula's guests, what led me there in the first place was kubbeh. Kubbeh are meat-filled bulgur and semolina dumplings that are either fried and served as an appetizer, or boiled and plunked into soup. I was after boiled kubbeh, specifically those that find their way into kubbeh hamusta, a sour, sorrel-based soup that I love. Sara taught me to make kubbeh hamusta. By "taught," I mean that she poured water into a big pot until the water rose halfway up her arm, then said -- in Kurdish-inflected Hebrew -- "See how much water to use? Good." She shaped five kubbeh in record time, without even looking down, and then had me do one. I started to curl the semolina dough around the meat, when before I knew it, she'd snatched the thing right out of my hand, managing to salvage it in the nick of time. Over five days cooking with Sara, I five pounds fuller and (maybe?) five pennies wiser. She was hilarious and accomplished, but she had no interest in teaching me. Fortunately, the internet exists. I've since taught myself to make a not-all-together terrible kubbeh hamusta. 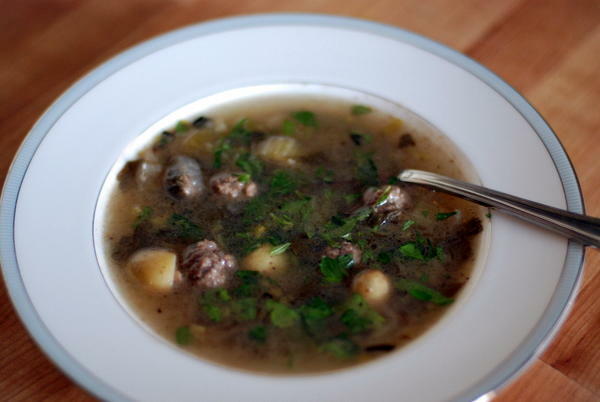 I recently learned that kubbeh hamusta is just one in a large family of sour meat-based soups. According to my brother, soups like this exist in Turkey and elsewhere across the Middle East. Needless to say, I want to try them all. For now, I'm settling for two. The second? Agrio. Agrio comes from Henry's mom, who is Syrian-Mexican. Henry's wife Rachel -- possibly more obsessed with Agrio than I -- shared this recipe, and for a while, all we did when we saw each other was gush about how delicious it is. The basic idea is this: make little meatballs, the float them and little baby potatoes in a broth full of celery, parsley, and spearmint. Just before serving, squeeze a whole bag of limes into the soup. You wind up with something not unlike kubbeh hamusta: salty, meaty, and surprisingly, pleasingly, sour. I was going to say that this was by far the best thing I served over the high holidays, but then I remembered that insane lamb shoulder and possibly my best batch of challot, ever. So it's a close contest. But this was a huge hit, and I'm thrilled to have yet another sour, meaty soup in my arsenal. Like all good family recipes -- like kubbeh hamusta, come to think of it -- the original formula for Agrio contains the occasional measurement, but mostly refers to quantities like "a bunch" or offers no quantities at all. ("Some beef broth" is one item in the recipe.) The quantities offered here, therefore, are very flexible. Feel free to alter them if you prefer a different balance, or if you only have 3 limes but still want to make the soup. But don't skimp on the parsley; you really do need all of it. 2 lbs. ground beef 2 tablespoons olive oil One whole head of celery, stalks and leaves, chopped 3 cloves garlic, minced 1 medium onion, diced 3-4 cups baby potatoes, halved fingerlings, or diced yukon golds 4 cups beef or vegetable broth 1 large bunch parsley (at least 3 cups packed) 1 cup lime juice (I needed about 8-10 limes) 1 bunch spearmint, leaves only Form the beef into meatballs the size of quarters. Add the oil to a large soup pot and set over medium-high heat. Add meatballs in batches, making sure not to crowd the pan. Cook meatballs for 2-3 minutes, until the bottom side is brown, then flip and cook an additional 2 minutes on the second side. Remove finished meatballs to a plate. When all meatballs have been cooked and set aside, you should have a nice layer of olive oil mixed with beef drippings -- perfect for your mirepoix. Add celery, garlic, and onion to the pot, turn the heat to medium, and sweat the vegetables until they start to soften but have not browned. Add the broth and potatoes to the pot along with all but a handful of the parsley and 4 cups of water. Turn the heat to high, and bring the soup to a boil. Then reduce the heat to low and simmer for 20 minutes, until potatoes are fully cooked. 10 minutes into cooking, add meatballs back into the soup. When soup is finished cooking, turn off the heat, and add the line juice. Stir to incorporate. Add the remaining parsley and all of the spearmint and give a couple more stirs. Serve hot.